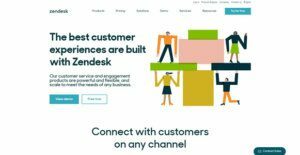 Its customer service solution is delivered through the Zendesk Support solution, which puts all customer interactions in one dynamic, user-friendly interface for an efficient, seamless process. You can bring in customer queries from almost any channel via pre-defined ticket responses, web widgets, and customer search history, allowing you to respond faster and with the right context. The main customer service support module can be customized to fit your customer service workflows or apps that you’re already using. It also features customer satisfaction ratings and analytics via performance reports and dashboards. There are trendy and widely used systems in each software category. But are they necessarily the best fit for your organization’s specific requirements? A trendy software solution may have thousands of subscribers, but does it present what you require? For this reason, do not blindly invest in popular systems. Read at least a few Zendesk reviews and mull over the aspects that you desire in the software such as the fees, main functionality, available integrations etc. Then, choose a few apps that fit your needs. Check out the free trials of these apps, read online comments, get information from the vendor, and do your investigation systematically. This exhaustive research is sure to aid you select the most excellent software platform for your company’s special requirements. We realize that when you make a decision to buy Customer Service Software it’s important not only to see how experts evaluate it in their reviews, but also to find out if the real people and companies that buy it are actually satisfied with the product. That’s why we’ve created our behavior-based Customer Satisfaction Algorithm™ that gathers customer reviews, comments and Zendesk reviews across a wide range of social media sites. The data is then presented in an easy to digest form showing how many people had positive and negative experience with Zendesk. With that information at hand you should be equipped to make an informed buying decision that you won’t regret.